Jeld-Wen windows is one of the biggest names in the business and offers a wide selection of materials and styles. Their products are available for both residential and commercial applications — for additional information and opinions on this company, refer to our page of Jeld Wen reviews. The Jeld-Wen company began in Oregon in 1960. At the time, there were just fifteen employees on staff. Today the company is still privately owned and employs more than 20,000 people throughout the world. Steady expansion and a stream of acquisitions has led to Jeld-Wen being one of the better known manufacturers around. This company produces a spectrum of windows, from low end available at places like Home Depot, to their higher end wood windows that can cost $800 installed. 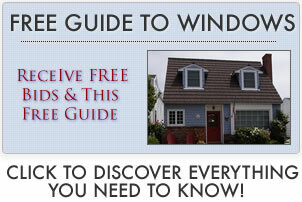 For detailed pricing from actual customers, see our Jeld Wen window prices. Jeld-Wen wood windows are the only wood windows in the industry that are made from AuraLast® wood. This is a solid pine treated with a specialized vacuum pressure process to improve the wood’s strength and durability. It provides excellent protection against water, insects (such as termites) and other decay. It also allows for a smooth and even finish when stained. These are energy efficient, come in a variety of color options and offer a limited 20 year warranty. The company offers two different collections of vinyl options to choose from. These are some of the most popular replacements they sell, come in many design options and offer a limited warranty. Their Flat Casing Vinyl Windows have a flat 3 1/2″ trim casing and come in many window styles, including double-hung and casement windows, as well as awning windows, fixed windows and others. Their Brickmould Vinyl Windows resemble the look of wood windows and come in a variety of styles as well, including single and double hung, sliding, tilt and more. Aluminum windows are some of the strongest types of windows available and are a great choice if you have large windows. Many commercial windows are made from aluminum due to their strength, along with their lightweight properties. These same properties make them a good choice for homeowners that have large or odd-sized windows. They are also easily painted if you decide you want to change the look of them down the road. The company offers separate warranties for its wood, vinyl and aluminum products. As always, there are numerous exclusions and issues not covered by this window warranty so customers need to ALWAYS thoroughly read the entire product warranty. On the plus side, the company provides a nice clean pdf that uses fairly clear language (relative to other companies) and standard type (none of the tiny print that is meant for lawyers).